Imagine opening your mailbox on your birthday and finding valuable gift cards from the best restaurants, day spas and boutiques in your hometown! That’s BirthdayPak! 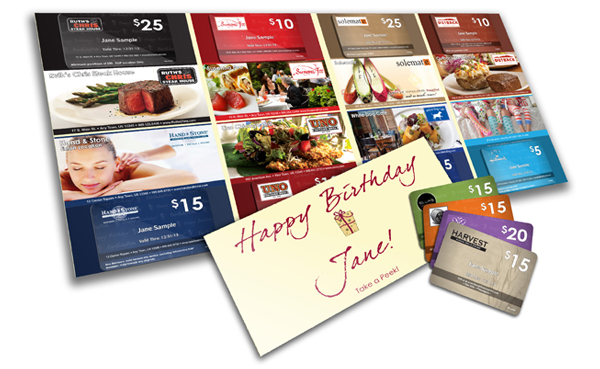 Celebrate your birthday with complimentary BirthdayPak Gift Cards and support the local businesses that make your home town special! BirthdayPak is a 2012 winner of "Benjamin Franklin Award for Direct Marketing Excellence". Known as "The Bennys", the prestigious awards are given annually by the Philadelphia Direct Marketing Association in recognition for excellence in marketing. As the resident visionary, Michael has set the bar high for BirthdayPak. With a pure direct-to-consumer marketing background, Michael developed the hyper-local BirthdayPak program to allow small and midsize businesses to effectively compete with the “big boys” on a level playing field. By combining emerging technology with fundamental marketing disciplines, Michael is connecting the best local businesses with the people most likely to become their best customers. As President, Paul's role is to keep a close eye on the finances and operations. Entering his 20th year in the direct marketing business, Paul has seen a lot of products come and go, but he is always quick to point out that, in that time, he has never witnessed a program with such strength and depth as BirthdayPak. Paul is energized by the pace of growth of BirthdayPak and is equally excited by what BirthdayPak offers to the communities around him. Emerson brings over thirty years of experience in management and business development to 365DIRECT. Beginning with First State Paper, a family owned business, his leadership skills proved critical during multiple transitions and mergers, ultimately seeing the company, Central Lewmar, emerge as one of the largest and leading independent paper merchants in the country with $900 million in sales. Emerson oversaw the distribution network, while maintaining operational responsibilities at each of the company’s 5 divisions. In addition to his management responsibilities, Emerson established the company’s “Sustainable Platform”, advocated the integration of emerging technologies, and developed new business working directly with major corporations to provide creative, cost-effective paper solutions. Emerson’s strong operational background blended with proven sales leadership will allow for him to have an immediate impact on the company’s growth. While BirthdayPak clients are presented with a clear, concise, and successful marketing program, BirthdayPak is an enormous powerhouse of data management, email marketing, and direct mail. These elements require a skilled eye for developing territories, analyzing lists, and managing the gagillion bits of data that make the BirthdayPak program a sustainable and expandable venture. Mike brings the experience, gusto, and eye for precision needed to make sure that all of the members of the BirthdayPak Community get their BirthdayPak on time.